During a visit to the Syrian Arab Republic, UNICEF Executive Director Anthony Lake meets with mothers and their children, and the people who are working so hard to reach every last one with life-saving services. DAMASCUS, Syrian Arab Republic, 29 October 2013 – During a two-day visit to the Syrian Arab Republic, UNICEF Executive Director Anthony Lake has praised the efforts of national partners, community and local organizations and volunteers in the provision of humanitarian assistance for the most at-risk Syrian children and women. UNICEF Executive Director Anthony Lake meets with mothers and their children, and those who are trying so hard to reach them, at the Abou Dhar Al Ghifari primary health care centre in Damascus. During his visit, Mr. Lake pointed to the incredible challenges hundreds of thousands of Syrian families are facing, within a context of economic disruption and social dislocation, and amid worsening security. Some 6.8 million people are affected in the Syrian Arab Republic, including more than three million children, while nearly two million children are displaced inside the country. In Damascus, Mr. Lake met with displaced children and mothers during child immunizations at the Abou Dhar Al Ghifari primary health care centre. Most of the displaced families who came to this health centre have fled from the towns of Daraya and Moadamiyeh, near Damascus. They live in collective shelters or with relatives. The women worry about the future of their children. There is, however, a widespread understanding of the importance of immunization. Women who had brought their children for vaccination shared their stories of survival and commitment in the face of adversity. Rawda left her house in Daraya 18 months ago. Every few weeks, she moves house, along with her mother and three children, trying not to put an extra burden on the relatives who host them. 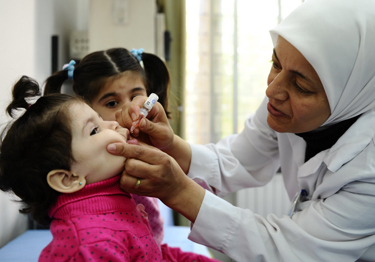 Primary health care has been significantly disrupted, as a result of the ongoing crisis. According to the Ministry of Health, as of July 2013, 60 per cent of public hospitals and 34 per cent of health centres had been damaged. There is also an acute shortage of health professionals; in some locations, including Homs, 50 per cent of doctors have left the country. Access to children and families is becoming increasingly difficult in some areas, including those areas effectively sealed off or otherwise affected by the security situation – which has a knock-on effect for children receiving vaccinations. And WHO has just confirmed 10 cases of polio in the eastern part of the country. UNICEF and WHO are supporting a Ministry of Health–led vaccination campaign. 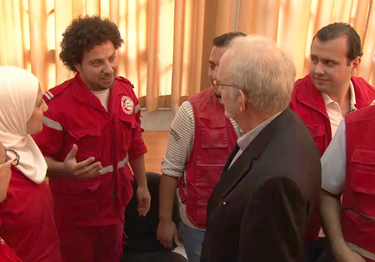 “The campaign will reach 2.4 million children with life-saving vaccinations, including 1.6 million under 5 with the polio vaccine,” says UNICEF Syrian Arab Republic Child Survival and Health Specialist Iman Bahnasi, who accompanied Mr. Lake during his visit. In 2013, UNICEF and partners have assisted in vaccinating over one million children against measles/mumps/rubella and polio. UNICEF has also reached 10 million people with access to safe drinking water. UNICEF is working with partners across the country to ensure that emergency assistance is scaled up, where possible, given security and capacity constraints.